**This is a limited time offer which is valid for the purchase of selected qualifying models and is subject to credit approval on qualified purchases financed during this program. Offer may not be combined with certain other offers, is subject to change and may be extended or terminated without further notice. 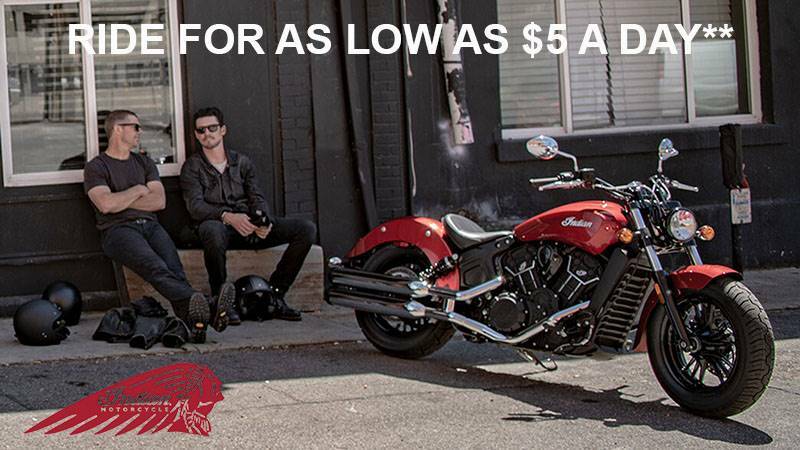 Offer valid on a new 2018 and 2019 Midsize Indian® Motorcycle. Monthly payment and cost of borrowing will vary depending on amount borrowed and down payment/trade. Minimum amount to finance is $5,000. Example: $12,499 financed at 5.99% APR over 84 months = 84 monthly payments of $150.40; financed amount of $10,299 with $2,200 down payment, total cost of borrowing of $2,334.95 and a total obligation of $12,633.95. An example of monthly payments required on a 84-month term at 5.99% APR is $14.60 per $1,000 financed. Monthly payment examples do not include taxes, title, and other fees. Indian Motorcycle® is a registered trademark of Indian Motorcycle International, LLC. Always wear a helmet, eye protection, and protective clothing and obey the speed limit. Never ride under the influence of drugs or alcohol. ©2018 Indian Motorcycle International, LLC. Offer Valid March 1 – April 30, 2019.